Prebiotics and probiotics are vital to your health, as they help to keep your intestine working properly. Prebiotics and probiotics are found naturally in certain foods, and are added to others. Additionally, they are available in supplement form. It is important that both prebiotics and probiotics are important parts of your diet; they work together to keep you healthy, and neither can work adequately without the other. Prebiotics are a type of fiber that is indigestible; in the intestine, beneficial bacteria feed off prebiotics in order to survive. In other words, they make the intestines favorable for the growth of probiotic bacteria. Prebiotics can help to improve colitis, diarrhea, irritable bowel syndrome and calcium absorption. Additionally, they can help your immune system by keeping the beneficial bacteria healthy enough to help fight off disease. Prebiotics are mainly found in fruits, vegetables and some grains. Examples of foods containing prebiotics include bananas, barley, flax, legumes, onions and garlic. Probiotics are beneficial bacteria similar to those found naturally in the gut. Some foods have added probiotics; after digestion, the probiotics remain in the gut and act to aid in digestion and immunity. Probiotics are naturally found in yogurt with live and active cultures, miso, soy drinks and fermented milk such as kefir. Manufacturers may also add probiotics to a variety of foods, so read food labels to see if your food contains any. As a prebiotic, garlic can help probiotics thrive within the intestine. 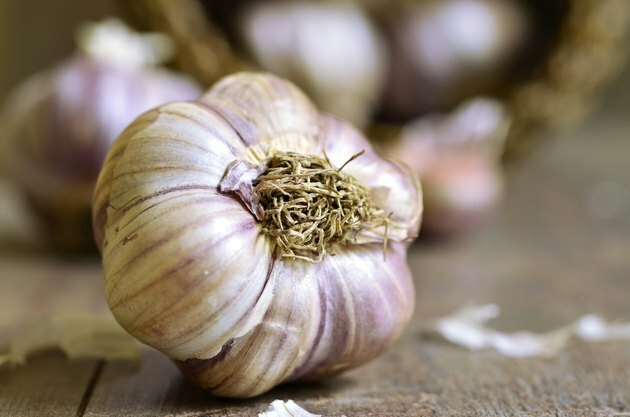 When consumed together, the indigestible prebiotics in the garlic will remain in the intestine where the probiotics that live there can use it as food. In this symbiotic relationship, the probiotics depend on the prebiotics for growth and survivial. Without adequate prebiotics, the probiotics may not get enough nutrients to survive, and the natural flora of your intestine will change. If the beneficial bacteria are underpopulated, other, more harmful bacteria can move in, potentially causing gastrointestinal problems. Probiotics and prebiotics are often used as complementary and alternative medicine -- CAM -- to treat or prevent illness. While prebiotics and probiotics have proven helpful to some people, more research needs to be done regarding their effectiveness. Prebiotics and probiotics may help to control symptoms associated with certain medical problems; however, they cannot be used to treat illness. Always report any symptoms you are experiencing to your doctor, and check with him before taking any supplements or other CAM treatments. Your diet, medications or medical treatment may need to be altered. Penn State University: What Are Probiotics? Do You Take Prebiotics & Probiotics at the Same Time? Do Probiotics Kill Bad Bacteria?